With the new football season under way, once again fans have to contend with changes to team kits. These days, it's often easier to recognise a big team by the name of their sponsor rather than their stripes. There is, to my knowledge, only one professional sports team in the world carrying a writer's name around on their chests. Instead of pointing to a bank, an airline, or a software giant, this team’s logo leads fans to an author’s domain name. So, what is the connection between Scottish side Raith Rovers and best selling author Val McDermid? Tom Morgan, Raith Rover's Commercial Director takes up the story. Traditionally, our kit sponsorship deals feature local businesses. Val McDermid has always been supportive of the club. We were aware of the fact that this season, Raith Rovers are in the same league as some big names like Rangers, Hearts and Hibernian. They have an international following and we wanted a sponsor on our shirts who could reach out to that audience. It was during a presentation ceremony of one her books at Starks Park, Raith's stadium, when Tom Morgan had his eureka moment. Instead of wearing the brand of a local business why not carry Val McDermid’s name? Why not flip the function of footballer's shirt so that it takes the Raith Rovers/Val McDermid story to a global audience? "We've been in the New York times as well as much of the British press," says Morgan. "It’s a real talking point. For a provincial club to get this kind of publicity is great." The smart thing about the Raith Rovers Val McDermid tie in is that it’s organic – home grown even. It wasn’t brewed up in a far removed marketing PR agency. The knot was already formed when Tom Morgan pulled the string. 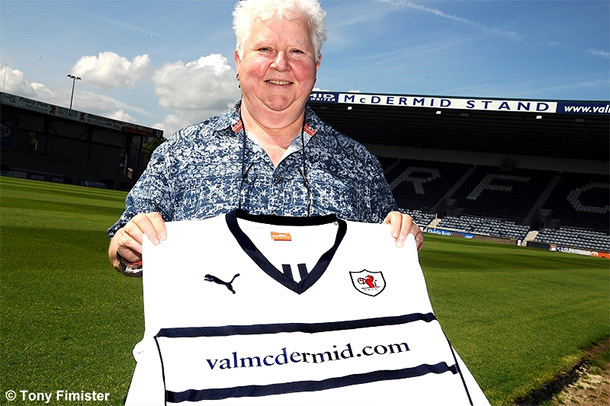 Val McDermid is a life-long fan of Raith Rovers. Kirkcaldy is her home town and Tom says, whenever there’s a home game, Val is sat in the front row of the stand shouting her head off. Raith Rovers, Tom Morgan and Val McDermid have a mutual affinity. They support their town, their roots, their club and each other. This relationship isn't just professional, it's professional plus. It's one that many big branded businesses struggle to emulate. In this context, it's quite easy to see how a football club whose number one fan happens to be a number one crime writer can work together. But remember – most sports clubs have famous fans and they have big marketing machines too – few of them make a connection. Award-winning crime writer Val McDermid's work has been translated into more than 30 languages. She's sold over 2 million copies in the UK and over 10 million worldwide. She has written 28 bestselling novels. She is no stranger to the value of stories and the importance of names. As well as crime fiction, she broadcasts and writes on a variety of subjects. This year she was a guest at the IPO's International Enforcement Summit. The use of Val McDermid's name helps bring Raith Rovers to a wider audience. It connects Val McDermid with her readers too. For McDermid, smart use of intellectual property is an empowering resource. Strong copyright laws, fair payments for writers and a clamp down on copyright fraud empower writers. Val McDermid and Raith are example of how unconventional couples can make new stories for themselves.